Scroll down to see an image gallery and slide show. 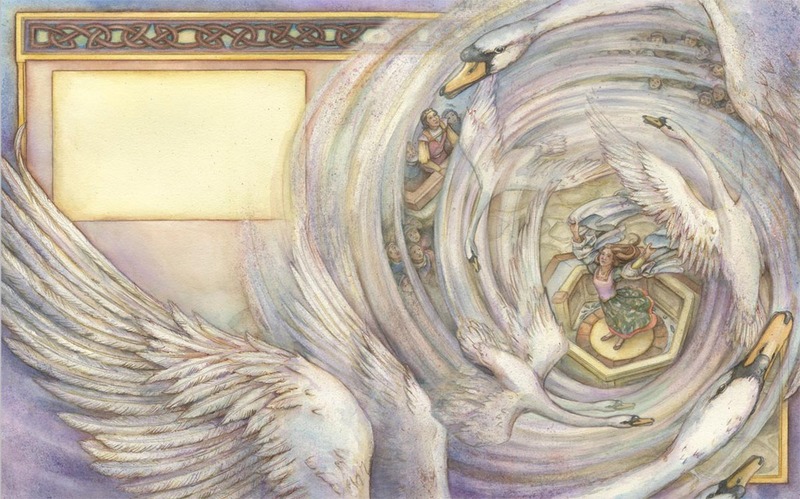 In this Grimm tale, an evil stepmother casts a spell and transforms six brothers into swans. They will remain swans until their sister, Princess Sophie, sews them shirts from thorny thistles. 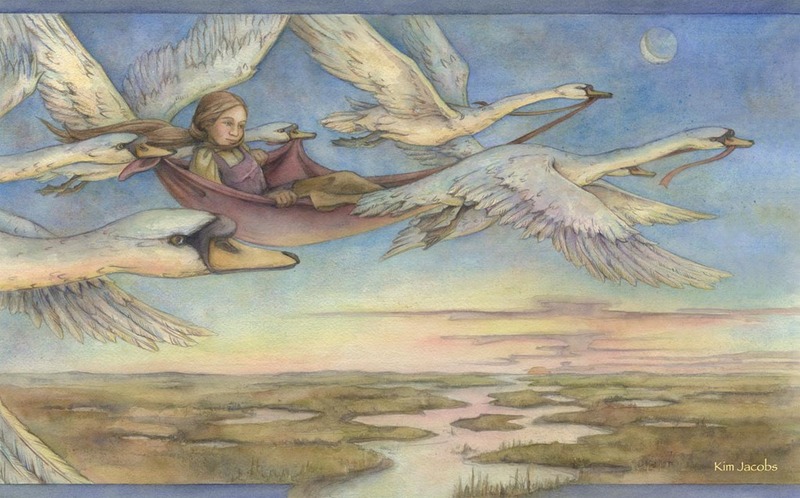 She must remain silent until her task is completed, or the princes will remain swans forever. Long story short: Princess Sophie loyally remains silent, despite dire circumstances; she marries a king and finishes most of the shirts, leading to a happy ending for all—except for the one brother who ends up with one arm and one wing. What makes this retelling fresh and new is that the story is told in first person from Sophie’s viewpoint. 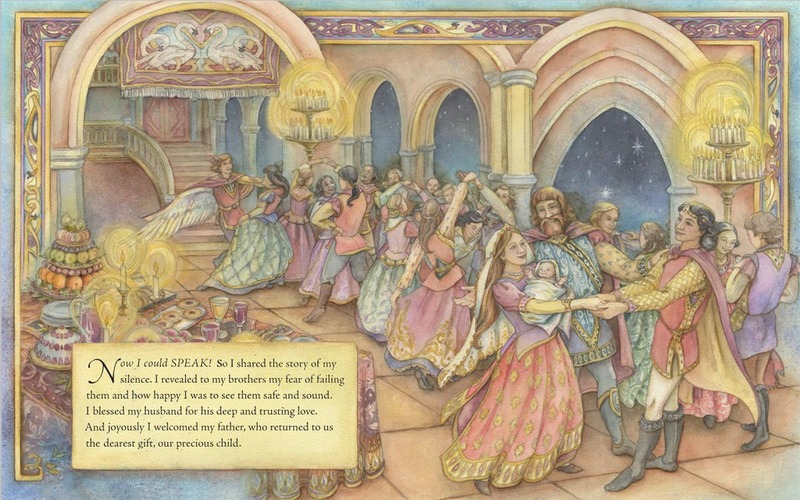 Readers see the loving, laughing relationship she shares with her brothers; Sophie’s tart tongue and rebellious nature prompt the curse of required silence, and she falls in love with the king because he sings to her. 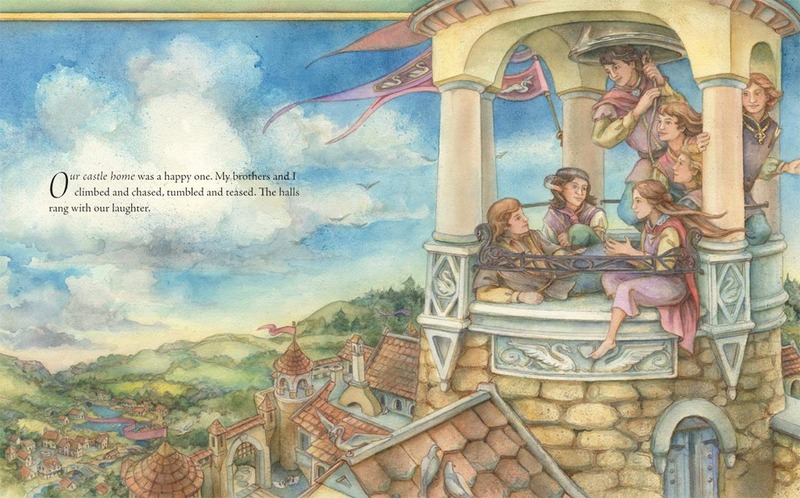 The lavish illustrations in muted, dreamlike colors sweep across pages, making this a very attractive addition to the folklore canon and a natural choice for storytime. 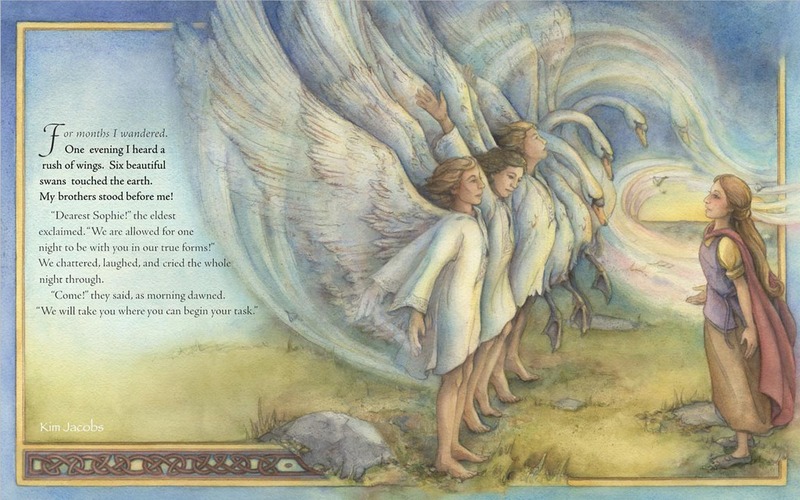 When her six brothers are turned into swans by their wicked stepmother, Princess Sophie must endure physical and emotional trials to save them in this warmly illustrated version of the classic fairy tale. 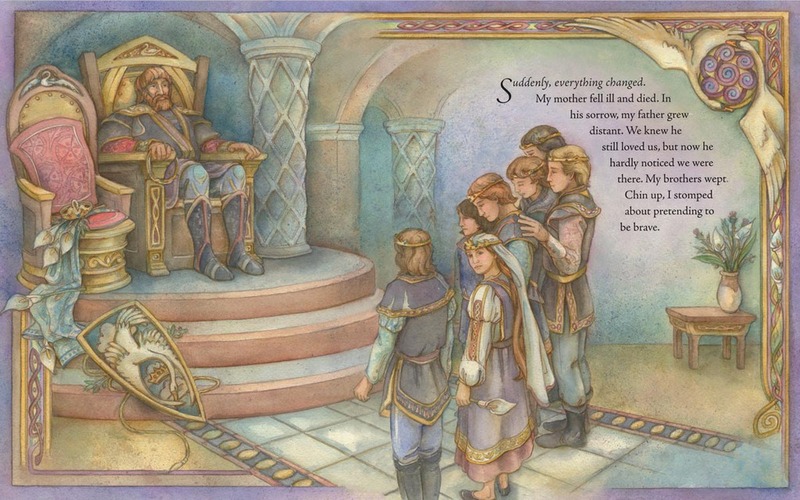 The seamless interplay of words and images makes the picture-book format ideal for providing narrative clarity as well as nuance to the central relationships that seem abstract in the original story. 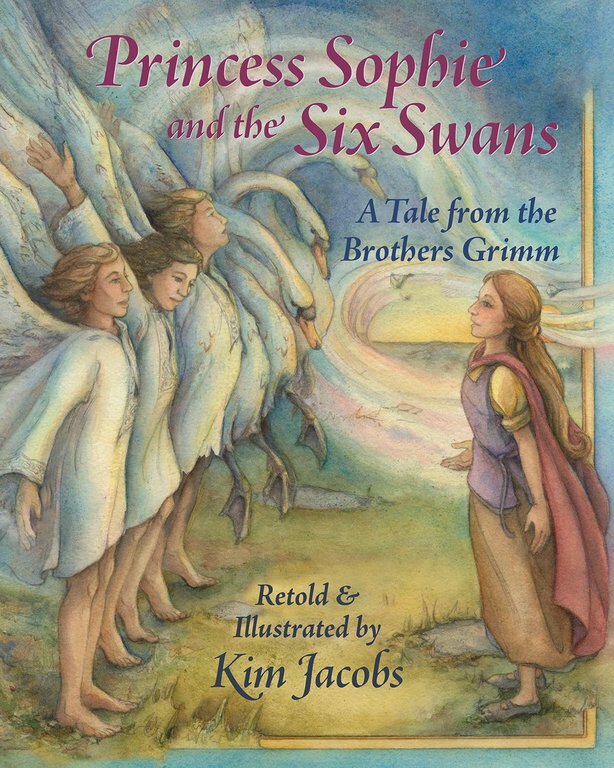 Jacobs’ alterations allot Sophie far more agency than the passive heroine of the Grimm’s version possesses, transforming the white princess into a passionate and tenacious girl who is unafraid of hard work and sacrifice in an effort to right a wrong. Her friendship with her brothers is well-depicted, making her great sacrifice reflective of her strong sense of character rather than familial obligation or feminine duty. Jacobs—an illustrator writing for the first time—has a masterful eye for colors and skillfully employs them to reflect the mood of a scene and drive the narrative. The dreamlike quality of the illustrations makes this version an ideal bedtime story; misty blues symbolize Sophie’s loneliness and isolation as she sews her brothers’ shirts, while the delicate swirl of rainbow color renders the brothers’ transformations especially magical.